Not only can you move your company’s existing email service away from complex and expensive servers that often need updating every minute or so, you can make this move for the benefit of your employees and your company’s productivity. Increasingly, employees are seeking flexibility in their work life and employers are working to save valuable resources, boost recruitment and increase retention. 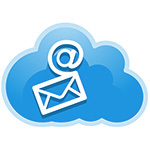 Moving your company’s existing email service to a cloud-based email option is one strategy to meet the needs of your company and employees. Currently there are unlimited ways for employees to communicate and collaborate digitally - social media, wikis and instant messaging just to name a few - email may seem old hat. However, email remains an important tool for internal and external communication and a vital link back to the office for those employees working remotely. Many companies may be hesitant to make this move, believing that cloud-based email is too costly or too much of a security risk. However, with careful preparation, cloud-based email can address not only cost and security concerns, but can also improve functionality, customer satisfaction and productivity. But wait! Before your employees pack up the office for home and trade their khakis for PJs, employers need to have systems in place to make the email transition, as well as all other functions, seamless. Whether it’s to enable remote workers, save on owned technology, upgrade systems or some mix thereof, companies need to develop a plan to migrate their internal email service away from a traditional server over to one of the many available cloud-based options. Effective and productive employees don’t sit around and wait for the next client or the next job. Employees need mobile, access-anywhere, anytime, email. With cloud-based email, as long as employees have internet access, they can work anywhere and on any device, i.e. smart phone, tablet or laptop. Cloud-based email increases collaboration by allowing employees, wherever they are, up to the minute project updates and the ability to sync up and work on documents in real time. Increased collaboration means increased returns on a company’s investment. According to a 2010 white paper from Cisco, a Frost & Sullivan survey that found companies which invested in collaboration technology saw a 400% return on investment. Approximately 800,000 laptops are lost each year in airports, resulting in serious financial implications. With cloud-based email, companies don’t have to worry about losing sensitive data on top of the cost of the stolen equipment. Cloud computing securely keeps all files in one central location, minimizing the loss of sensitive information and lost productivity. If employers are looking for a strategy to boost recruitment, increase retention, increase productivity and have happier, healthier employees, saying yes to cloud-based email is the right approach.